Firespinner Iceplant This perennial is ‘Mountain Grown’ at Alpha Nursery and is an ‘Idaho Preferred’ Plant. This perennial is a ‘Plant Select’ plant. Firespinner Iceplant has a cool looking flower that has orange on the outside and the inside is purple with a yellow center button. It is a semi-evergreen perennial that is great for a ground cover. It has green foliage that takes on a reddish tone in the fall. It will grow to a height of 2 to 3" and spread from 12 to 18". Firespinner Iceplant is a 'Plant Select' plant. 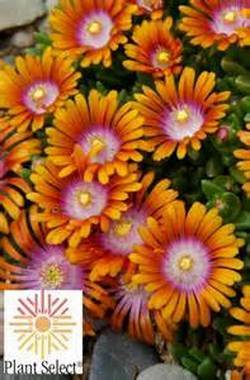 Plant Firespinner Iceplant in well drained soil in full sun to partial shade. It will grow well in containers and is deer resistant. It will attract butterflies and is also a Firewise plant. Use it along borders, among rocks, in a rock garden, or next to walls.